The hardships endured by diggers. At the Break O Day claim, Waiotahi, which adjoins the Rising Sun and Peep O Day, the amount of work achieved by the claim holders and the vast improvements made through their energy and perseverance is staggering. The area of their claim, which a few short months since was thickly wooded with the growth of years, has been transformed into a well organised quartz mining ground. Liddle and party’s claim on the Moanataiari, which comprises seven men’s ground, has been worked for four months. A drive has been put in 20 ft and as well as a shaft of 50 ft. The latter has, however, been abandoned for the present and unlike many other parties, they have taken the precaution to cover up the idle shaft to avoid the possibility of accidents which are of too frequent occurrence on these goldfields. The population now located at the Thames is estimated at around 10,000. The Tauranga brings about 59 diggers to Kennedy's Bay. A cry of fire alarms the inhabitants of Shortland. A raupo house in the open space on the beach nearly opposite the office of the Thames Advertiser, and at the back of the Union Bank, is ablaze. In a few minutes the frail structure is razed to the ground and all the household effects it contains are destroyed. The large hut has not long been built and it is said to have been tenanted by persons of questionable repute. There is something mysterious about its destruction. The tenants are absent at the time, and it is strongly suspected that the fire is the willful act of someone wanting to rid the locality of unwelcome neighbours. Several complaints have been lodged against the tenants with the police. Carters are wanted at the Thames; a few good bullock teams would pay their owners handsomely. At present so much of the quartz comes from a distance to the machines on the beach and there are really so few teams at work, that occasionally a mill or two are seen not working for want of stone, while up the Moanataiari, Waiotahi and Kuranui there are thousands of tons of quartz lying on the ground. Several claims have lately been pegged out on the right hand branch of the Tararu Creek. Some very fine lodes of blue and grey quartz have been found cropping out there. The leveling and filling up for a site for the new company who are going to erect 50 head of stampers on the beach beyond the Kuranui Company’s machine is rapidly progressing. The large boiler from the Great Barrier has arrived by the Clyde. Messers Cruickshank, Smart and Co are also leveling a large space in the Moanataiari Gully for large and efficient machinery there. There is some talk of a tramway being made from the beach up to the Moanataiari as far as the Grand Junction claim; this will be a great boon to the diggers, it is almost impossible to convey quartz in any quantity down the gully due to the present state of the road. Considering the short time since the Thames goldfield has been discovered and the disadvantages under which miners have laboured, the hilly character of the country and the lack of sufficient machinery, it is astounding the way in which the men have cleared the country, cut roads and tracks and achieved an immense amount of work. To sink a shaft or put a tunnel into a large hill, patiently to work away day by day, week by week, month by month, waiting wearily for machinery and managing day by day on only little means – such is the case with hundreds. A leader is discovered in the Shotover claim, surpassing in richness any other found on the Thames goldfield. The Resident Magistrates court at Shortland is formally opened this morning, but then adjourned until Monday next, pending the completion of improvements at the new courthouse. Three tenders have been received by the Provincial Government for the construction of a wharf at Shortland and the lowest tender, that of Mr Cadman, is accepted. Sago and starch, chicory and kerosene. The new goldfield at Kennedy’s Bay has provided further work for the owners of small craft - the bays at the Thames, Tapu Creek and Kennedy’s Bay are studded with fleets of them. A railway line to the Thames is called for and the powers that be asked to consider whether the present existing highway over the sea is the only route by which the El Dorado can be reached. There has already been a survey of a line of railway or tram road to Drury and the Waikato – perhaps a deviation could be made from that district to the Firth of Thames. Looking at the maps of the province the scheme appears reasonable enough. The distance from Drury, by way of the Hunua and Banks County, to the Firth of the Thames, in a direct line, is probably not more than 20 miles. The sea passage to Shortland, or the new wharf at Grahamstown, would be about 11 miles. Presuming that these distances are roughly correct, and Drury about 24 miles from Auckland, the latter place may be said to be 55 miles from the Thames. Eight or nine hour’s sea passage is wearisome and fatiguing and the hours of arrival mean that little or no business in the evenings can be attended to. The population of the goldfields is swelling and by spring may number, with wives and children, some 15,000 people. If rail could be managed Shortland Town might be said to be about three hours from Auckland. The country would also be opened up and instead of the western port monopolising machinery, other areas would reap considerable benefit. Fresh provisions, vegetables etc could readily be conveyed to the shores of the Firth and landed in Shortland Town with little loss or deterioration. The goldfields are rapidly increasing in importance and communication with the district would be improved. A house is being built on the Prince of Wales claim No 1, Karaka Hill, at a height of no less than 1,000 ft above sea level, the hill appearing to rise almost perpendicularly. At the Ruby claim, on the Waiotahi, near the Rising Sun two fine leaders are uncovered. A great deal of labour has been expended on this claim without success until now. The Just in Time claim, Moanataiari, has been worked for seven months as seven men’s ground. Several samples of their stone resemble a coral formation in which rich particles of gold stud the interior of the snow white cavities and are very pleasing to the eye. The famous machine of Clarke and Kesterman has been erected a short distance up the creek, and a corner of their own ground has been handed over to the Thames Crushing Co on payment of a bonus of £100. It is being excavated by about 30 workmen for the powerful 24 stamper machine which the company intends to build there. The Dumbarton Castle party, Waiotahi Creek, strike gold surpassingly rich. The Provincial Hospital report notes in its return of the sick treated during the week ending today that there was one fatal case of typhoid fever from Tapu, the patient expiring after three days in hospital. The Commercial Report advises that the demand for all kinds of goods for the Thames diggings is doubtless the cause of a steady improvement in business. Bottled beer of good brands is scarce, bacon and hams are wanted, candles are scarce, and although there are good stocks of coffee, chicory is scarce. American salmon is in excellent supply, hardware stocks are light, hops are available in small quantities, oilman’s stores are in fair demand, sago and starch are scarce, bottled fruits are inquired for but consumption is very limited. There is a full supply of kerosene, linseed is scarce, there is very little rice, soda crystals are scarce, caustic soda much wanted, spirit stocks were until recently excessive – they are now however bare, heavy stocks of tea are being reduced, tobacco is available, and the demand for cigars is not great. A fiddler astride a boiler. St George’s church at the Thames is opened. The Venerable Archdeacon Lloyd of Auckland officiates before a crowded congregation. After Holy Eucharist, the Morning Prayer and the litany, two infants are baptised. The whole of the church service is chanted, including the litany. Vocal assistance had been promised from Auckland but unfortunately the inclemency of the weather prevented many ladies and gentlemen from visiting the Thames to assist with the opening services. The choir, thrown upon its own resources, renders the choral portion very creditably, especially as the music sung would try the capabilities of the best trained choir. The church is tastefully decorated with ferns and has an eminently ecclesiastical appearance, although it is quite a plain structure. The edifice is of good dimensions, the altar has above it a window of three lights, and there are two entrances. Additions in the domestic Italian style, such as the pinnacles of the gables, are not appreciated by some who would like to see them replaced by something more in keeping with the rest of the building. Archdeacon Lloyd regrets to announce that, through a failure in the lighting of the church, evening service will be celebrated two hours earlier than usual, namely 4pm. Plans for a musical soiree this evening are also abandoned. The remains of Andrew D Fitzpatrick, a miner who expired on Friday evening, are interred at the Roman Catholic burial ground. Fitzpatrick was formerly of the Waikato Militia, stationed at Ngaruawhaia, and was highly respected by a large circle of acquaintances. The Rev Father Nivard reads the burial service. Mr George Whittington officiates as undertaker. A number of the deceased’s friends and miners accompany the remains to their last resting place. A boiler intended for the Star of North claim makes a start for its destination and a number of diggers from that and adjoining claims are on the spot to assist. A fiddler placed astride the boiler plays inspiring and lively tunes urging the miners in the work of hauling and pushing the unwieldy mass up the hills. Substantial huts and whares of every description are being built about the Thames and miners are making themselves comfortable for the approaching winter; though the climate is not so severe as that of Otago or Westland, still it is advisable for the diggers to house themselves well, as there promises to be a great deal of rain this coming season. All talk of Kennedy’s Bay is dwindling and it seems the nine day wonder is over. Men begin to think there is little or no alluvial gold in the area, many contending that if there is - it is up the Thames before the Ohinemuri and not to the north. The Thames hills and various claims are progressing very favourably due to the energy and pluck, and indomitable perseverance displayed by the men of this goldfield. In spite of the lowering clouds and threat of winter, work is everywhere the order of the day. Unfortunately, regardless of the determined courage shown by the diggers, there will be some distress when the winter comes. The majority of the men on the ground have but small means. There is much hope, though, that spring will do great things for the Thames. Messrs Clarke and Kesterman are making a tramway from Tookey’s Flat to the Grand Junction claim, a distance of nearly three quarters of a mile to facilitate the carriage of coal etc up the Moanataiari. Permission has been granted to Clarke and Kesterman to lay a tramway down the creek to the beach which should be completed in one month’s time. From 30 to 40 men will be put on this work at once. These gentlemen can be looked upon as nothing short of being public benefactors, as they have already laid out several thousand pounds in improvements and speculations. Machinery is still wanted – not 10 or 12 stampers, situated at large distances apart, but machines of 40 or 50 stamp heads, at almost every quarter of a mile up all the gold bearing creeks. The Royal Blue claim will soon be possessed of a very powerful Chilean wheel to be worked by steam. The boiler is 22 ½ ft by 3 ½ , and a new system is to be adapted in regard to the pan and rollers. The Nil Desperandum has struck a leader of extraordinary richness and a large heap of quartz is piled up outside their drive. The reef runs down and forms the vertebrae of a thickly wooded spur. 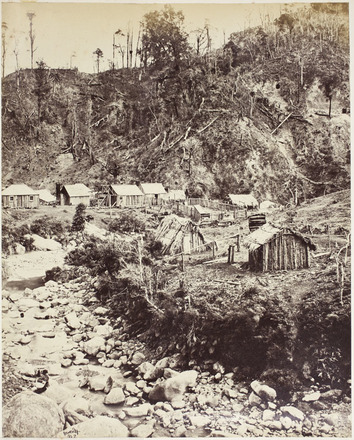 For some time the shareholders of the Star of the Karaka have been unsuccessful in their search for the precious metal, but upon taking up two men’s ground, which was abandoned about six weeks ago, they almost immediately strike gold on the abandoned field. They set to work, felling the bush, stripping the earth and expose a hillock of casing. At Tapu Creek, the Full Moon claim have struck a rich vein of auriferous quartz which is dipping into the ground of the New York claim. In the New York claim gold is frequently seen in the large six foot reef that the party have opened up. There have been a great many complaints at Tapu lately about the Post Office at Shortland – anyone seeking a letter is frequently obliged to wait half an hour: there is generally a crowd collected around the small window from which the letters are issued, the one clerk is totally inadequate for doling out the epistolary effusions to the Thames diggers. There should be three or four windows and three or four clerks to issue letters – one has far too much to do. The Thames is assuming the habits and manners of a town, with the exception of good streets and roads. It is intended to open a lodge at Shortland for the Ancient Order of Foresters, the lodge to meet at the Bendigo Hotel, Pollen Street. Robert Graham has resigned his seat for the electoral district of Franklin in the House of Representatives; the election of his successor will rest with the miners of the Thames district. Twenty year old William Francis (Frank) Buckland enters the field as a candidate for the vacant seat and Mr W C Brackenbury prepares to issue an address to the electors. Frank Buckland is a politician, privately tutored and a previous attendee of Parnell Grammar School and St John’s College. He has trained as a civil engineer and was employed by the engineer's department of the Auckland Provincial Council before joining the Colonial Survey as a surveyor. His father is William Thorne Buckland, member for the Raglan electorate. A miner is sluicing in a creek a little below Tapu township when a large boulder rolls down the hill and hits him, breaking his leg. Mr Clayton, who has just arrived at Tapu to act as chemist and druggist, is at once in attendance and succeeds in setting the broken limb. The sufferer is much relieved. 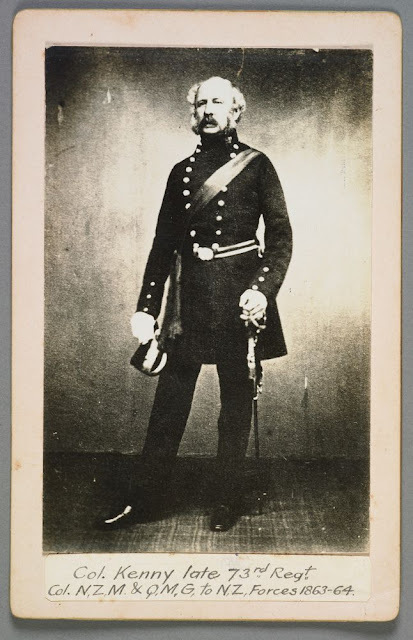 The first annual inspection of the Auckland Rifle Volunteers is held today by Colonel Kenny, Inspector of Colonial Forces. The weather is wet and squally, disrupting the original arrangements. At 11am 170 volunteers, including a number from Thames, muster in the drill shed, Princes Street. They are put through manual and platoon exercises after which they are marched into the Albert barracks for Inspection. Colonel Kenny says, with regard to absentees from the Thames, he would recommend that they should be leniently dealt with, but it rests entirely with the Government to decide whether fines would be enforced or not against those volunteers living at the Thames. About 250 officers and men are present, some of whom, at great personal inconvenience and expense, have come up from the Thames expressly for the parade. One member of the corps, who is seriously indisposed and not wishing to have to pay the fine for non-attendance, has not been there long before he faints in ranks and has to be carried away. The men, having been drilled for about two hours in the shed, are then marched to the Barrack square and undergo a very minute inspection by Colonel Kenny. He puts them through a series of manoeuvres and this is no easy matter, owing to the very soft and slippery state of the ground, the rain at last making it necessary for them to return to the drill shed. On the whole, the volunteers acquit themselves with credit. This corps, which is the youngest in the province, having only been formed last November, is now one of the best drilled. The number of members on the roll is at present very small, with several of them absent at the Thames. The Rifle volunteer penalty is £5 and widely thought to be unfair to the members of the corps at present on the Thames diggings. The fine is most harsh and arbitrary, since no provision is made for bringing them up to Auckland free of expense, and members of the diggings do not care to leave their occupations for several days at considerable cost and great personal inconvenience. The men are dismissed having been on drill 3 hours and 20 minutes. There is a sense of dissatisfaction over the Provincial Government’s lack of communication with the Thames Improvement Committee. The government proposes to send to Shortland a plant to lay down a tramway from the beach at Shortland to the Kuranui, round the base of the hills. They invite the diggers and shareholders in claims to contribute labour and money in laying down the rails and in forming branch lines from the several creeks to the main track, on the very shadowy chance of getting back a portion of their outlay in dividends. The scheme is quite inadequate for the town’s present urgent wants. If the government polled the district man by man, nine men out of 10 would condemn it. The Provincial Government further sketch out a visionary scheme of an extension to Puriri on the south and Hastings/Tapu on the north of Shortland. But what the Thames wants is, firstly a wharf, and secondly one great main-metaled road from Shortland to the Kuranui. The tramway should be taken along the beach in as direct a line as can be struck to the Kuranui. It is considered monstrous that, in a place where good plain roads and a wharf are all that is wanted, the government comes and offers, not the residents, but a body of contractors, the use of a plant which has cost the province not far short of £50,000, with liberty to cut up lines of road, and by refusing to make the streets compel the inhabitants to use the tramway and pay the charges leviable. The township has paid business licenses which never ought to have been charged – so much per foot for frontages to imaginary streets. They have built stores and paid for them, purchased goods in the Auckland market and paid for them also, as it was well known in Auckland that at the commencement of the goldfield anyone trading at the Thames could not get credit. A new paddle steamer for the Thames trade, the Lady Bowen, built by Messrs Niccol and son of the North Shore, is launched. She has engines of 25 hp and is one of the neatest and prettiest steamers seen afloat. Messrs Dunn and O’Brien have selected a site for a 14 stamper machine at Tapu/Hastings and go to Auckland to make arrangement for its purchase without delay. Tonight Walter Thom, a miner passing homeward, and 10 yards off the regular track near the Karaka Creek, suddenly finds himself in one of the water holes and sinking over his head. The moon has gone down but Walter keeps himself afloat as his cries for help alarm tent owners on the Karaka. People from a nearby tent run to the spot with a rope, which Walter is able to grab hold of. He has a severe bruise on his head and is taken to a tent where he is kindly treated until he is able to continue his journey. There is little doubt that another fatal accident would have been added to the list already arising from the same cause. A number of holes in the Karaka have already been filled up, thanks to the forethought of Mr Mackay, who has ordered the work to be done by prison labour. The Franklin district was probably named after Lady Jane Franklin, the wife of Sir John Franklin, who at a very early date crossed the Manukau Harbour in a mission schooner and was conveyed by a Maori party to Waiuku, long before there were any settlers in the area. After the Constitution Act of 1853 the area from Newmarket to Lake Taupo was known as the Southern Electorate. In 1860 the electorate was divided, that portion to the east of the Great South Road and the Waikato River being named Franklin. The Franklin electorate existed from 1861 to 1881 as a two-member electorate, when it was split into the Franklin North and Franklin South electorates.One of the first MP's, Marmaduke Nixon was killed in action in 1864 whilst leading an assault on a Maori village during the Invasion of the Waikato, forcing the 1864 by-election.